Historic August: How Well Did You Manage Behavior? In this historic month of August, around the time some government credit ratings were downgraded due to threats surrounding the size of their deficits, 72% per cent of Canadians owed money; 40% were unprepared to handle their financial obligations in the event of an emergency and 26% had less than 3 months of savings in case of disaster—like job loss, or disability, for example. Financially speaking, these are weak branches to cling to in the aftermath of a big financial storm. With so much debt to contend with, people abdicate their purchasing power to their creditors, every day. Translation: that makes you poorer, faster. Unfortunately, some people see volatile economic times as the right ones to increase debt—margin accounts, investment loans and home equity loans. Showing people what lies ahead doesn’t always help much. We can receive information about the strong underlying growth in the economy, together with learned five year economic forecasts that back up this new growth. But this is all meaningless to most of us if we are in a state of panic, or prolonged shock. Investors, in fact, do exactly the wrong things at the most volatile times. Individual investors become more agitated by what they have experienced in the past, than by market forecasts of what their future experience will be. They lose money in times of great volatility because this is the precise time they want to change their path, trade against their advisor’s advice and thereby causing great damage to their portfolios. How much damage? Staggering, based on a large scale study of large scale study done in Taiwan over several years. Taiwan has the world’s 12th largest financial market. The losses to individual investors from trading were approximately 2% of GDP for Taiwan over the study period, 1995 to 1999. . . and those were good, stable years in the market compared to recent times (2008-2011). Investors would have been better off financially to put their money under their mattress than to trade on their own accounts. This is further support for the notion that the best that an investor can do is to construct a very low cost, tax efficient portfolio based on global diversification and then let their professional work closely with them during volatile times to manage their financial behavior. That, in fact, is one of the key roles of your financial advisors: to stop your reactive responses which could significantly erode your wealth. It’s Your Money, Your Life. You will need an astute team of professional financial advisors to keep you from trying to outperform the market by trading the portfolio. In short, you don’t have to recover from financial disaster alone, and in fact, you shouldn’t. Evelyn Jacks is President of Knowledge Bureau, a national post-secondary educational institute focused on excellence in financial education. The comments above are excerpted from her latest book entitled Financial Recovery in a Fragile World, co-written by Al Emid and Robert Ironside. This can be pre-ordered at www.knowledgebureau.com. Barber, Brad M., Yⁿ-Tsung Lee, Yu-Jane Liu, and Terrance Odean (2009). “Just How Much Do Individual Investors Lose by Trading?” Review of Financial Studies. Author Evelyn JacksPosted on August 30, 2011 August 30, 2011 Categories Income TaxLeave a comment on Historic August: How Well Did You Manage Behavior? Not only do tax season blues manifest themselves into very costly gaffes at tax filing time, prepaying too much tax quarterly, too, takes a toll on cash flow and on your investment strategy, too: Nothing worse than having to take the money out of the marketplace at exactly the wrong time, for no reason. It appears, though, that neither extreme volatility in the marketplace, warnings of imminent recessions and a debt-laden households can stop this wealth eroding phenomenon: every year millions of Canadians pay too much in taxes. They fail to file tax returns, they pay late filing penalties, they miss using all the deductions and credits that are available to them. And the next time this happens is just around the corner: September 15, when the third quarterly tax instalment is due. Good news: If you made quarterly instalment payments over the past couple of years, and you expect your income will drop again this year, do know that you can switch from the “billing method” CRA uses to remind you to send money, to the optional instalment calculations using either a prior year or current year estimate. Make sure you see your tax or financial advisor about this and let them do what you are paying them for: advise you on the correct amount of taxes owing next month. This could really enhance your winter vacation planning if you find you don’t owe a December 15 instalment either. Remember too that missed deductions can reduce lucrative Child Tax Benefits, or cause a clawback of Old Age Security payments. You’ll need to save receipts now to enable a better result. Another lost opportunity arises when you miss making RRSP contributions that could in fact, increase both those amounts—which could turn into much needed monthly cash flow when income from investments or jobs are at risk. It’s Your Money. Your Life. Remember, you are required to arrange your affairs within the framework of the law to pay the least amount of taxes possible. You are not required to overpay your taxes. In these difficult financial times, you’ll want to pay yourself first. 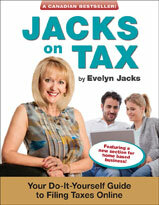 Evelyn Jacks, is the author of 46 best-selling books on the subject of personal income taxation, including her latest, Essential Tax Facts, and the President of the Knowledge Bureau, focused on excellence in financial education. For more information call toll free 1-866-953-4769 or visit www.knowledgebureau.com. Do you believe that, in times of volatility, investors follow the financial advice that they are given? You might be surprised at the answers. It appears that investors want to do exactly the wrong things at the most volatile times. Investors are influenced less by economic forecasts that predict the future; rather, they become agitated by what they have experienced in the past. In other words, they remember the pain of the losses they have experienced. Investors to lose money in times of great volatility because this is the precise time they want to change their path and trade against their advisor’s advice. The result is significant damage to their accounts. A study done in 2009 based on data from 1995 to 1999 in Taiwan, reinforces this even though the period was a particularly good one, by today’s volatile standards. In the world’s 12th largest financial market, total losses to individual investors from trading aggressively were approximately 2% of the country’s entire GDP! I hope you’ll participate with your opinion too. In the meantime, it’s good to focus on what you can control: (a) debt management (b) tax efficiency (c) the cost of your investments (d) how to work smarter with your professional advisors. It’s Your Money. Your Life. The key role of a great financial advisor in volatile times is to stop investors from inappropriate trading reactions that will significantly erode their wealth. This is a highly prized service by clients—but often only in retrospect. Listening to your advisors now, and following your wealth management plan, will pay off. In the middle of a hot summer, the markets are volatile; investors are nervous. This is the time for great advisors and great advice to shine. They know that it’s what happens when the boat rocks that differentiates a great advisory team from a poor one; good results from bad ones. In fact, when opportunity meets preparedness, even the perfect storm cannot topple a well-planned execution through disaster and swiftly, into recovery. Given our recent economic history, we all should be ready for the after-shocks of financial crises, with both strategy and process as events unfold. Great advisors are on that page, and their clients are ready. They have helped their clients manage debt, save more money, and make more immediate decisions to guarantee their needs are covered in difficult times. They have done this with strategy, process and communication, and now are positioned for a swift recovery from the current malaise. Besides personal disability or death, financial vulnerabilities for Canadian households include rising interest rates in the not-to-distant future; of more immediate concern as a result of the recent debt crisis in the US. At the end of July, the Finance Minister of Canada warned Canadians to batten down the hatches and get ready for the storm in light of the potential for higher interest rates. Job one: manage debt loads, especially as it relates to mortgages. His theme was echoed by Glen Hodson, chief economist and senior vice-president at the Conference Board of Canada, who predicted that a downgrading of the U.S. government’s credit rating would lead to a rise in interest rates as well. A downgrade by Standard and Poor to AA+, of course, has now happened. That’s where working with a great financial advisor really pays off. The inter-advisory discipline of Real Wealth Management™ involves the accumulation, growth, preservation and transition of wealth, with purchasing power: after tax, inflation and fees, including interest. We have found that advisors who follow the discipline have clients who are prepared for the perfect storm, positioned for quicker recovery in case of disaster, and ready for the opportunities that come when the winds subside. It’s Your Money. Your Life. The great advisors of the day are shining this week as they lead their clients through the financial storm of the day. Take note. They are likely people you want to work with in the future.